Xbox One and mobile devices will get a new interactive TV series in 2014. At the Electronic Entertainment Expo (E3), Ubisoft announced that it is delivering an interactive TV series playable on mobile devices and next-gen consoles, partnering closely with Microsoft to bring it to Xbox One, the all-in-one games and entertainment system from Microsoft. The Rabbids Invasion TV series, created by Ubisoft Motion Pictures in partnership with France Televisions and Nickelodeon, airs later this year. 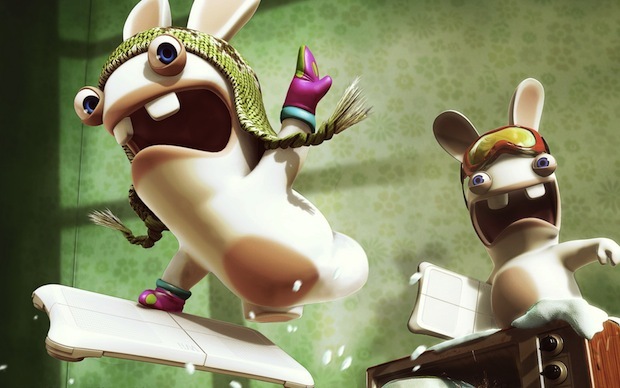 Rabbids Invasion The Interactive TV Show will be available in 2014. The interactive series is being developed by Ubisoft Paris with support from Ubisoft Barcelona. With more than 14 million games sold, the Rabbids are some of Ubisoft’s best-loved characters, and their wacky adventures appeal to kids and families across the globe. With Rabbids Invasion The Interactive TV Show, the majority of the 78 seven-minute long CGI episodes from the original Rabbids Invasion TV series will be adapted to allow the audience to join with the Rabbids in acting out some of their crazy antics. Thanks to the integrated motion control and voice recognition of next-generation consoles, Ubisoft is able to create an innovative mix of classic television programming and the interactive elements of video games. On mobile devices, Rabbids Invasion The Interactive TV Show will be playable using touch technology as well as other features such as the camera and microphone.